In 2001, I published a series known as the Travel Distribution Library. Here is a chapter from the first book in the series, eCommerce Pioneers. Remarkably, not much has changed and while I got a few things wrong, the bulk of my predictions panned out. The GDS industry was born in the mid-1970s. Today, over 30 years later, it appears that the GDS as we have known it will not survive much longer. It will have been a phenomenon of the latter years of the 20th century and the start of the 21st century. Given that brief history, it’s tough to predict where the industry is headed over the next 30 years, not to mention the balance of the 21st century. Undoubtedly distribution technologies not yet dreamed of will take the place of today’s GDS marketplace, and whether the GDS companies embrace those technologies, or evolve into some different function or purpose, is anyone’s guess. Thus we will narrow our outlook to the next decade. Even with that narrow slice of time, the technology is changing so fast that today’s predictions could be hopelessly out of date by 2010. The travel industry and our society as a whole are in a period of unprecedented change. The changes do indeed come without warning and can alter the fundamentals of business and the competitive landscape literally overnight. From unlikely new market entrants to commission caps and consumer direct distribution by suppliers, or even a troubled stock market and continued threats of terrorism, the travel distribution industry finds itself threatened in ways that we could not have imagined when my first book was written in 1999. If the GDS companies are going to survive, it goes without saying that they have to focus their efforts on increasing efficiency in all areas of operations to improve profitability, speed decision making and generally become more agile. They need to look to new types of partners and to different economic models to sustain their businesses. There are two vital areas where all four GDS companies must focus in order to ward off obsolescence and keep competition at bay. The first is the area of innovation. The second focuses on people, both from the customer perspective and the employee community. On a daily basis we are bombarded as technology invades every corner of our lives. We can use computers to communicate, produce, calculate, entertain, research and discover in ways that were not available to or even contemplated by our parents and their generation. My 4 year old daughter now shows my 80-year old mother-in-law how to insert the CD-ROM into the computer to play her toddler computer games and switches from a mouse on the home system to the touchpad on my Powerbook laptop with ease. She is the master of the satellite remote control, the DVD with wireless speakers in the car and she can often be observed walking around the house with my discarded analog cell phone up to her ear. As I have had to travel for my consulting practice, nightly I can see updated pictures of her over the Internet. We are raising a generation that has never known life without computers, satellite TV and digital cellular phones and cameras. They cannot imagine life without the Internet and email. As this group comes of age, constant product innovation and ease of use will not just be expected, it will be demanded. Since my entry into the travel industry in 1978, technology has shaped travel distribution in a profound way. Paul Blackney of Worldspan said it this way: “Travel technology has played a pivotal role in the development of an entire industry and in fact has dramatically shaped two others.” He contends that without the GDS systems, airline deregulation would never have worked and the travel agency industry wouldn’t be where it is today. Since the mid ’70s the computer dramatically changed internal operations and communications for travel suppliers and intermediaries alike. Now, the Internet is transforming marketing and sales and the entire life cycle of the relationship with the customer. Yet by and large, the travel purchasing process is still largely constrained by the way that the original computerized reservations systems were built over 25 years ago. The travel industry is constantly looking for the next innovation, that “new, new thing” described by Michael Lewis. 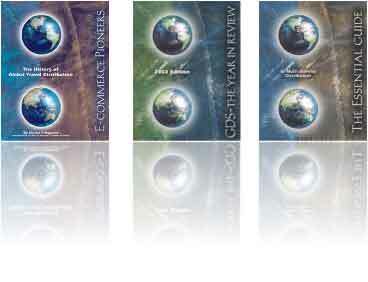 The GDSs have brought forth innovative solutions during the past quarter century to be sure. But at the same time, multi-million-dollar cottage industries have sprung up around them to fill the gaps caused by their legacy system environments and their propensity to develop both products and services internally. The fact remains that the core travel distribution and transaction engine services provided by the GDS have become by and large a commodity with minimal distinction beyond price. Even the airline hosting and out-sourcing service component could be considered a commodity item. And so, finding a unique value proposition, better business models, richer products and more robust, consultative services may be the best chance for the GDS not only to survive, but to truly differentiate itself from the competition. Although each of the GDS companies has had third-party marketing programs with product suppliers to extend their product and service offerings, this approach has not created sufficient differentiation for the core reservations business, since few of the partnerships are exclusive. The GDS firms are now waking up to this lost opportunity by partnering with other firms to deliver the solutions and the innovation their customers are demanding. · Consulting and design firms providing end-to-end e-commerce solutions to both suppliers and intermediaries. Innovation is not just about products, it is an attitude, a driving force behind all major successes. An organization infected by this particular bug is one that will have high energy and a contagious spirit about them. It is amazing what excitement can do for productivity and profitability and a company’s position with the investment community. One of the most frustrating things about this new millennium is that for the most part, the various travel systems on the market still sell travel the way suppliers want to sell it, not the way human beings wish to buy it. Even colorful Web sites often reflect the old vestiges of the legacy system calls vs. resembling the dialog that takes place between a busy executive and an administrative assistant or a trusted travel agent. One-to-one marketing seems to be the watchword of the age. Whereas productivity was the product focus for the ’90s, point-of-sale personalization is the mantra of the ’00s. Giving suppliers and travel intermediaries the ability to reach a market of one with the right product, at the right time, at the right price will be key to being a market leader as we begin this new century. Having said that, we are compelled to evaluate the GDS industry’s future and the factors that are vital to the success or failure of the individual companies that this author was charged to review. The GDSs are facing competition on many fronts. The competition for talent has been a major issue. During the dot com boom, companies had the promise of options and future wealth to dangle in front of candidates, yet until they went public themselves, the GDS companies had to continue to operate within the old, airline-ownership mentality. They are working hard to change their cultures, but shedding themselves of the old bureaucracies is not an overnight job. People—not companies—come up with breakthrough thinking and thought leadership. The organizations that truly understand this and come up with ways to attract and hold on to the right people will have a tremendous competitive edge in the future. The GDS companies are at a crossroads. To continue to build on the traditional cash-cow business, ratcheting up booking fees in the face of the clear promise by suppliers to go direct is a risky proposition at best. This is particularly true when the very customers they wish to approach in e-commerce business, applications hosting services and outsourcing are the ones they are alienating by raising their fees. Diversification into the corporate, consumer and information technology services arena is prudent, but there is still another dimension of the business that deserves exploration. Travelers and agencies alike have relied on the quality of information that has been the core value of the GDS for over 25 years. Travel content on the Internet is expanding daily, but becoming more and more fragmented by the moment. Content aggregation and facilitation of e-commerce to a whole new class of supplier is the new game. The GDS companies have the opportunity to reshape the industry and redefine their value in the distribution food chain. If in fact the GDS companies are going to continue to marry buyers and sellers as a key part of their business, through their metamorphosis they must seek a balance between finding the right economic model to keep the core business profitable, but still compelling suppliers to continue their participation. Conflict between the various channel players will continue. There is no end in sight for the growth of supplier sites and the desire of the consumer for more places to shop for better value. There are few, if any, travel suppliers now that are refusing to provide direct booking, no matter how supportive they are of their travel agency channel. This continues to foster the conflict that exists between the suppliers and the agencies. Suppliers will continue to look for alternatives to GDS distribution and we will begin to see wholesale withdrawal from one or more GDS systems by major suppliers over the next few years. They will also continue to cut deals directly with major corporate accounts, bypassing both the agency and the GDS for those travel transactions. Agencies, Suppliers and GDS companies will be at odds as well, unless the GDS can introduce new business models that will create a better balance as it relates to the fees that are charged for their services. In the past the suppliers have borne the bulk of the financial burden for the GDS and the agencies have been the beneficiaries, often not paying for the use of the GDS and actually receiving cash as a reward for productivity. Industry experts agree that the advent of the Internet and its impact on the travel industry represent one of the greatest events in the history of travel distribution. The Internet could even be said to have single-handedly broken the GDS monopoly on travel inventory and pricing. The Web handed off the power previously held by travel intermediaries directly to the traveler. The Internet gave travelers information and choice, along with the ensuing chaos which is inherent in rapidly opening up what was previously a totally closed industry and set of systems. The number of households using the Internet will continue to increase. Europe will catch up with the U.S. in the usage of the Internet as the telecommunications environment is liberalized and the price for access becomes more competitive and reasonable. We see the Internet continuing to play a growing role in sales of travel, with the number of individuals purchasing (versus those that just browse or “shop”) increasing exponentially during this time horizon. The top brick and mortar travel agencies will finally either invest in a consumer brand online or will purchase existing brands. Direct distribution by suppliers will proliferate and will mature in that suppliers will have tools that will allow them to intelligently navigate the multiple channels that are facing them, knowing how much inventory to allocate to each channel, at what price, at what time. The number of companies operating on a worldwide scope will likely dwindle to three, or perhaps even two. The GDS companies will also continue to invest in or acquire some of the online agencies, which will also see significant consolidation in the coming years. There also will be consolidation on the IT services front, with acquisitions and mergers taking place specifically among those companies providing services to the airline and tour operator communities. The major airline alliances and a need for a newer technology base will be a major driver in these areas. Although the remaining GDS companies will be publicly traded (albeit as a division of a public parent), there will be strategic investment by companies previously unknown to the travel technology community, such as media giants, IT outsourcing and telecommunications companies, Web portals and/or major online retail concerns. Airlines will continue to divest themselves of their GDS assets in favor of direct distribution through channels such as the mega-airline Internet sites or new distribution mechanisms such as Priceline or its successors. Hotel companies will consolidate and will solve some of their legacy system challenges with newer technology that helps them intelligently distribute their products to more cost effective channels. Until a couple of years ago, GDSs had a single category of customers: travel agents. Now that’s rapidly expanding to corporate travel offices, Web sites, even individuals. Likewise, the suppliers are also burgeoning. Where once the suppliers were primarily airlines, now they run the range of theaters, exchange services, insurers, destinations — virtually any leisure time attraction. As the public tires of the fragmentation and lack of quality control in the online travel information realm, the GDS companies will regain strength as content aggregators for this new marketplace, in addition to increasing their role as the transactions engines behind the majority of the consumer Web sites. One of the companies may even take the lead in this area and become the “utility” provider to the balance of the industry, including its own competitor(s) using new technologies such as Web Services to connect to a new host of players. Three things will happen here. First, the GDSs may well move into retailing in a bigger way. They’re already operating electronic agencies, so the natural next step would be to operate “bricks and mortar” agencies, thereby locking up distribution outlets. This will also give them the 24/7 service capability needed to become the outsourcer of call center services for other online travel retailers and to give the traveler the ability to seamlessly “book and obtain service anywhere.” Second, the GDSs will supply their services to a growing array of electronic appliances, ensuring their reach into the consumer (retail) marketplace. Lastly, they will begin to take inventory risk, as well as shifting to a merchant model to increase their ability to aggregate content for their various distribution channels. If the GDSs are to be successful in marketing themselves to the retail sector—the traveler himself—they must offer much richer content than they do today. Look for these companies to move quickly to add “consumer” content in the fashion of today’s travel Web sites. Along with this, the GDSs may bifurcate their services into two channels—one for the travel agency, with little content; and the other for consumers, with abundant content. The smart ones will become electronic libraries, actually storing the content on behalf of the supplier as a service. Moving into the retail/consumer sector will mandate changes in the way the GDSs market their products and differentiate themselves from competitors. They will have to become service oriented to a greater extent than ever. And internally, they’ll have to hire the best and the brightest. Their products will have to be customized to the market and personalized to the traveler level and they will have to harness the incredible power of the data marts they have amassed. This will likely be done by acquisition of or partnership with the top e-commerce booking engine firms. This will return valuable lost revenues to the GDSs. You can expect GDSs to diversify into services previously unimagined. Some will be services for the trade (IT consulting, software development) and some for the retail customer (rating services, travel news and critiques, possibly even city entertainment guides) leveraging their network of agencies with local knowledge. And in the wake of the terrorist attacks, travel suppliers and the government itself may also be a new customer for the processing of security checks on “bad guys”. At least one of the GDS companies will take the lead in 2002 to completely overhaul the old GDS business model, for both agencies and for suppliers. This will be in response to continued reductions/elimination of commissions and a transition to net fares, first in the airline sector and later throughout the industry. All of this—and more—will probably come to pass within the next 10 years, and the GDS of today will look like a meager product compared to the GDS of 2010. Beyond 2010, who knows? Maybe by then we’ll have virtual travel, and nobody will travel any more, obviating the need for the GDS as we know it. At the end of the day, the only thing that is truly constant in the industry is change. We are a connected industry and the global distribution system companies played a valuable role as the pioneers of electronic commerce. The public has relied on the deep integration of the GDSs’ services into the travel agency community and now the Internet world to provide an incredible amount of choice and content. The business will continue to be intensely competitive in all of the sectors where the GDS companies are conducting business. Globalization and diversification will help spread their risk. In the post-PC era, mobile telephony and the Internet will dominate the transition away from legacy systems. New quantum computers will become commonplace, using ultra wideband telecommunications technology. XML and its successors will facilitate a new type of communication between systems and within applications programs. XML has been key to the success of the Open Travel Alliance standards body and it is also critical to WAP technology as we know it today. Web Services will provide new ways to link legacy system environments to newer technology platforms. As these technologies emerge and eventually mature, it will become critical for leaders to provide inspiration, vision and belief in a common purpose. Executive teams will need to embrace the risks, empower their people and dare to be different. The economics will most certainly change. The strong will survive. Every morning in Africa, a gazelle wakes up. It knows it must run faster than the fastest lion or it will be killed. Every morning in Africa, a lion wakes up. It knows it must run faster than the slowest gazelle or it will starve to death. It doesn’t matter whether you are a lion or a gazelle. When the sun comes up, you’d better be running.